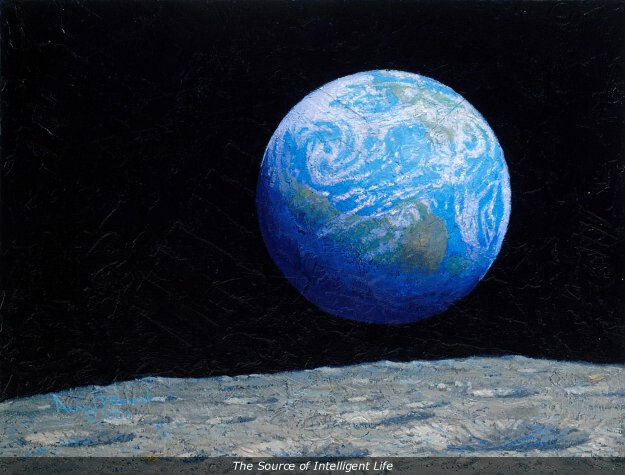 As I looked at our beautiful planet Earth from our small Command Module windows, I thought of all the humans that were out there living their lives on that little blue and white ball. It just did not seem possible that the tens of thousands of people I had seen at sporting events and on TV and at shopping malls and driving around in their cars, much less the 6.4 billion that are alive on our planet right now, could really be hanging on to that tiny sphere so that they wouldnÂ¹t fly off into outer space. As we look at my painting we can see the west coast of Africa to the right just turning into night. And to think, most scientists now believe that all of us humans are direct descendants of a single woman in Africa several hundred thousand years ago. Even those as far away as South America which we can see just coming over the western horizen. Her descendents have journeyed far from Africa to make their homes all over our planet. Her offspring have created the modern world, and all that we have now. IÂ¹ll bet during her probably brief and difficult and dangerous life she looked up at the brightest light in the night sky and wondered what it was, never imagining that her children might visit there someday. My guess is that she thanked her lucky stars for that soft bright moon light as it helped her avoid the wild animals and human predators that inhabited her difficult and dangerous world.